Koinonia is a lay Christian community inspired by the life of the first Christians as reported in the Acts of the Apostles. Members of the community live as one family, sharing dreams, successes and failures, while always fostering stronger bonds of brotherhood. 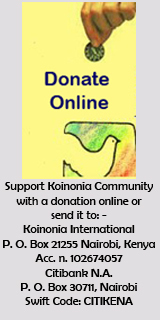 Founded in 1980 in Bauleni, Lusaka, the Community is involved in various activities and programmes that aim to uplift the society within which Koinonia is based. There is a sister community in Nairobi, Kenya, and another one in the Nuba Mountains of Sudan. In its effort to counteract the economic and social evils bred by poverty and individualism, Koinonia gives priority to the marginalized members of the society, such as children in difficult circumstances, especially street children, women and young people from poor backgrounds. Father Renato Sesana, known to everybody in Kenya as Father Kizito, has received a prestigious award assigned every year in December by the Lombardy Region in Italy for “Peace and Solidarity”. Mthunzi young Men that have finished secondary school and are attending different colleges have together started food production so that they contribute to their upkeep and the upkeep of the Mthunzi boys and children. Who remembers the Nuba people of Southern Kordofan? Once again they are alone—trapped in the middle of a war. The area which includes the Nuba Mountains is part of Sudan, and it borders the newly independent South Sudan. The place names of this little known geography are strange and confusing. Beyond the names are a people who number about a million caught in the middle of two wars: the war between Sudan and South Sudan for control of the oil fields and the war against the Nuba people themselves because the majority supported South Sudan independence. They fought along side the freedom fighters of South Sudan, but at the negotiating table were denied the possibility of self-determination. About 3500 secondary school students and over 70,000 attending primary schools have been affected by the raging war. Some have made it to South Sudan to seek education in the camps while others remain home stranded, not knowing how they will cover the long distance to the land of sanctuary.Abdel Aziz al-Hilu, the SPLM-N leader in the state confirms in an exclusive interview with NewsfromAfrica's Eric Sande. The children who sleep in the streets, reduced to begging to make a living, are a testimony to the unjust and inhuman policies of the Zambian government. Ten Mthunzi boys sat for their grade 12 exams last year and successfully passed their exams. The impact of climate change in Mthunzi - Kasupe and Tubalange. Mthunzi boys who have completed secondary school and awaits their results together with those going to college have engaged themselves in agriculture production in view of increasing the quantity and quality of the food available to all people living around Koinonia. An report by Mike Mwenda on their recent stay with four friends from Italy - Veronica, Anna, Stefania and Elisa at Mthunzi.